I didn't even know she had a shoe line! I like hers so much. I must admit, though, that the red sole would be great to one day have. What a great budget version! I think I'd go with the Paris Hilton shoe on this one. i always applaud an impressive replication, and this is no exception. What a beautiful shoe for a fab event! I do like the deeper pink of the Loubs though. These shoes look absolutely delicious! I do prefer the lighter shade of pink though, but that ruby red soul of Louboutins are always just so enticing! I think Ms Hilton's version are a more wearable shade! 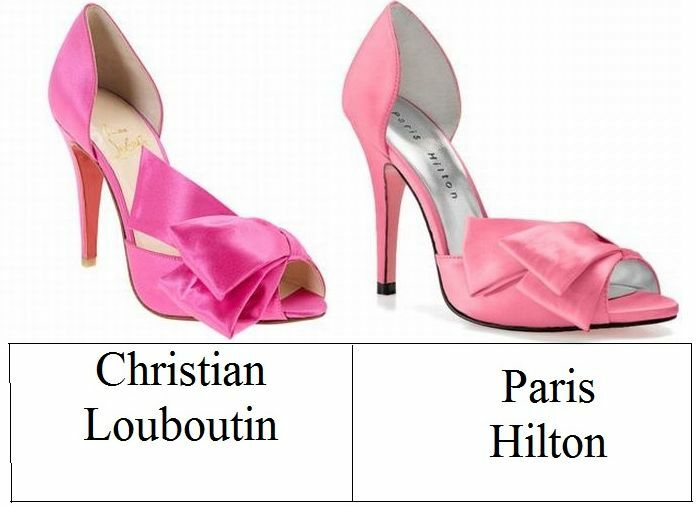 While I’d love to have those Louboutin’s, the Paris Hilton version would work just fine for my taste. The pale pink shade is really pretty. I think this would look cute with a black dress and make the shoes a standout. I just went on the site and the blue pair is really pretty too! Wow, E! You are really a pro at this! I want the Paris Hilton ones in a bunch of colors! I love her shoes because she carries size 11 since she is one! Goodness, I love the Louboutins, but the Paris Hilton does look like a nice shoe for the price! both of these shoes are fabulous!! but of course, i'd go for the cheaper one b/c they are soo similar! oh i love the light pink paris ones! although i've been wanting hot pink heels for sometime now. must start saving! Definitely the Hilton shoe. I actually like the bow on top better on that shoe, it's a little more sleek. I'm obsessed with Louboutins. That's totally my pic! SO PRETTY! I suppose Paris gets a point here; however, nothing will ever compare to my love of Louboutins. As much as I love the red sole on the CL shoes, I would definitely have to say I would go with Paris's shoes. I even like that shade of pink better! With my teacher's salary I'm definitely having to go thrifty. I love the fact that fashion can be accessible - and the most interesting things do actually come from fashionistas that create... and don't buy it all ready! Vive la créativité! I didn't know Paris has shoe line. I'm not generally a fan of her's, I'm surprised to say I actually like these! Just b/c of the name, I can't go with the Paris ones. I actually like the Paris Hiltons better. Just a wee bit cuter. That's so funny, they're almost the same! But for the diffrence in price, I'd be buying the Paris Hilton ones. I prefer the pink of the Louboutins! The Paris Hilton color looks to much like Pepto Bismol to me :o/ They are practically identical though! Another fab find! BTW- It does look like tea bag wallpaper, but I don't know for certain. I did love the decor though! Very cozy and since we were the first ones there (the baptism was early), I was able to take pictures of the entire place uninterrupted! For the price I'd say Paris Hilton, but I'm not too crazy about the shade! Though I suppose if I really tried to come up with an outfit I wouldn't mind. Wow, I didnt know Paris' shoes were quite so gorgeous! I like how she's created an affordable version of this Louboutin pump. Seeing as I prefer the paler pink colour, I'm voting Paris all the way! I would definitely go for Paris' version. I like her perfume. Erika, this just may be my all time favourite Thrifty Thursday EVER! I'm in love with both of these heels, and would totally be willing to forego the gorgeous Christian Loutoutins for a nearly eaqually stunning pari of Paris Hilton's. WOW, and what a price difference! I adore these pink shoes! I think they're both cute! I like the Louboutins a little more, but the difference isn't worth the price. I like the Louboutins more, but for the price point, I'd get the Paris Hilton ones. I would love a pair of CL pumps. Sigh, way too expensive. 0ne day red soles you will be mine!!!! GREAT choices ma cherie. I may actually get those hiltons! Wow they really look a like ! I love Louboutin but they're so expensive . Haha . I definitely prefer the Louboutins. They are so pretty and I defintiely prefer the colour. I adore both pairs! So so pretty!!! I neve fail to be amazed by your ability to find such cute cheap alternatives to awesome clothing! I would go for Paris, they are just as sweet and I think the lighter color makes them a little more versitile. You could wear them to a club or a wedding. OOOh, yes please!! Oh I have to choose?? Well, since the first pair costs the same as two plane tickets home for Christmas, I think I'll go with the PH. They really are lovely. And I completely agree with you on diffusion lines. Target is Target; dresses need to be affordable. and berlin WAS SOOOOOOooooo good! nice job with these finds, as always, Erika! have a great weekend. I think they are both super cute!! :) LOL can I have both ? ;) Happy Friday! Have a great weekend! This is an awesome cheaper version! I may have to get these! As much as I hate to pad her already bulging purse, I'll be giving Ms. Hilton my money! In grey and pink...I need them! Gotta love the Louboutin coz of the hot pink color. Paris' is pink but not hot pink enough like Louboutin’s there. Plus, I'd give anything to have those red soles.